Designed to be up to 50% quieter than normal shredders, the Rexel Whisper V30WS Strip-Cut Shredder will shred up to 7 sheets at a time into strips measuring 5.8mm wide. Ideally suited for personal use in the home or small office, this shredder has a P-2 security level for everyday shredding (for more confidential shredding, consider a P-3 level shredder or above). 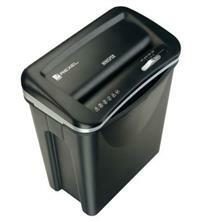 The 18 litre bin can hold up to 80 shredded sheets, good for home and small office requirements - and in addition to paper, the shredder can also get through staples and paper clips. That means you can just focus on the shredding and save the time of having to remove these beforehand. Overheat protection means that the shredder will go into cool down mode if it gets too hot and the shredder comes with a 2 year manufacturer warranty. So if you are looking for a shredder that cuts down the decibels and is suitable for lighter home or small office shredding, consider the Rexel Whisper V30WS Strip-Cut Shredder.